On our group cycling holidays we bring together groups of people from all over the world. What better way to get away from it all, than to bike around Ireland’s scenic coastal routes, cycle the famous Wild Atlantic Way, exploring at your own pace, free to stop where you please, while fully supported on our tours. Our cycling tours allow you feel like an independent traveller, free to cycle each day at your own pace and explore the country with plenty of time to make stop or detours. Leave your worries behind and allow us do all the work so that you can enjoy the many wonderful experiences that these cycling holidays have to offer. Deciding which cycle tour will probably be your hardest decision. Will you head west to Galway and Connemara, taking in the rugged splendour of the Burren? Or will you travel northwest to the Highlands of Donegal, meeting some of the friendliest people along the way? Who can rule out the splendour of the southwest coast, the Kingdom of Kerry and Beara Peninsula of west Cork? Our daily cycle is a leisurely 30 – 40 miles, which we find gives plenty of time to stop and explore your surroundings. Longer options are available for those who want to stretch their legs. Our Donegal and Kerry safaris are hillier than the other routes but happily there are no large mountain ranges to cross in any part of Ireland. The group sizes vary from 8 to 20 people. For 2019 we are guaranteeing all date departures. However, if the numbers are under 8 people, we will be running the tour as a self-guided tour for those who have booked and not with an accompanying guide. Everything else will still be included and will remain the same – your accommodation booked, luggage transfers and back up service. When the groups reach 8 or more people, a guide driving a support van leads each group. She/He will sweep during the day to check on cyclists. In the afternoon they will be gone for about two hours to leave the luggage off at your accommodation, so may not be on hand to give you a lift, but there is no rush and you have all day to complete the ride. As soon as the guide has delivered the luggage to your accommodation they will sweep back to do a final check on cyclists. All our group guided cycling tours start on a Saturday, simply click on any of the tours further down this page that you are interested in travelling to and discover our tours in the area along with the group departure dates. Enquire today – why wait for a better time! Our Clare and The Burren Guided Cycling Tour covers all types of landscape, from the rolling green fields and quiet roads of County Clare to spectacular coastal rides along the limestone landscape of the Burren. 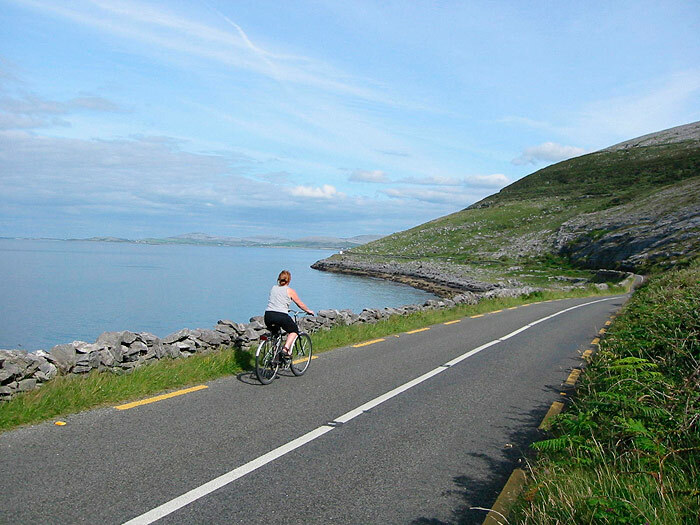 Our Connemara Mayo Galway Guided Cycling Tour explores the beautiful region of Connemara famous for its rugged granite landscape as well as its beautiful lakes and rivers. 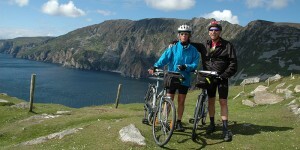 Our Highlands of Donegal Guided Cycling Tour explores one of the undiscovered gems of Ireland. 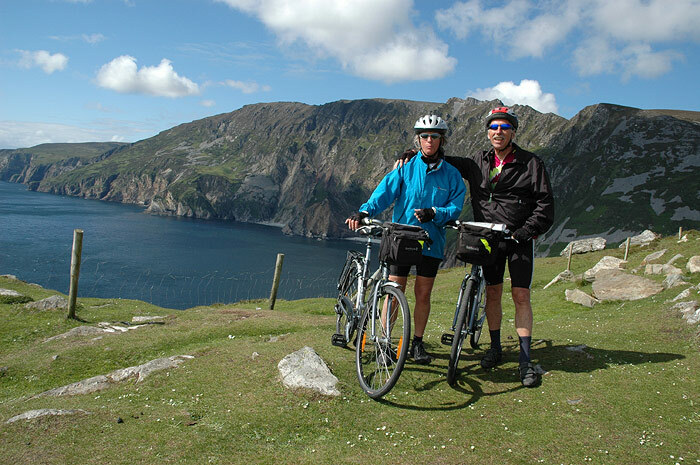 Our Ring of Kerry and Dingle Peninsula Guided Cycling Tour offers arguably the most spectacular landscape in the country and is home to Ireland’s highest mountain range. 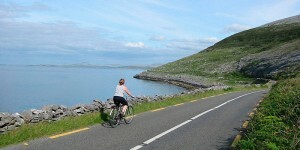 Our West Cork and Kerry Guided Cycling Tour covers some of the most spectacular scenery that Ireland has to offer. Our West Cork Coastline Guided Cycling Tour travels quiet roads lined with wild, deeply scented flowers, this tour covers all types of landscape, from rolling green fields to spectacular coastal rides. Our Wild West Mayo Guided Cycling Tour is like stepping back 20 years in time to an Ireland before the Celtic Tiger!